My series on overcoming obstacles to traveling the world turned out to span 2 months, generate over 100 comments, and had my inbox filled with messages from people who wanted to, had, or were currently overcoming the 7 obstacles themselves. I travel around the world full-time and can teach how to travel as much or little as you like as long as you’re willing to put the effort in to do. Learn step-by-step what you need to know to travel the world in your terms. Traveling the world seems like a huge undertaking daunting enough that it prevents most people from following their dreams. It’s scary when you look at it as a whole – leaving your job and regular routine to live out your dream of long-term travel – and why the best approach is to break down the monster. 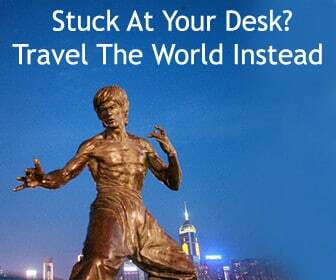 Let’s tackle, together, the 7 major obstacles to traveling the world that hold people back. 1. You Are Comfortable At Your Job – Figure out why it keeps you from traveling even though you might want to escape it along with information about talking to your boss and financing your trip after leaving work. 2. You Think It’s Too Expensive – Learn how little you actually need to spend and countless waist perfect your budget along with modern ways to save money. 3. You Don’t Know Where You’d Go – Big dreams can often be as discouraging as large problems and you’ll need to come up with a basic place and route to follow. Don’t let the word “plan” put you off though, this is one very fun step! 4. You’ll Miss Your Family and Friends – Use technology to shrink your world even further. 5. You Have Kids Or Will Soon – There are many permanent travelers who children and traveling families. Meet some of them and hear their stories. 6. You Don’t Know What Your Significant Other Will Say – Work together to put your travel plan in focus and prepare for many of the difficult points you’re likely to come across. 7. You Will Travel The World…Later – Understand the psychological reasons we procrastinate and learn how to grab hold of a quiet but powerful obstacle. 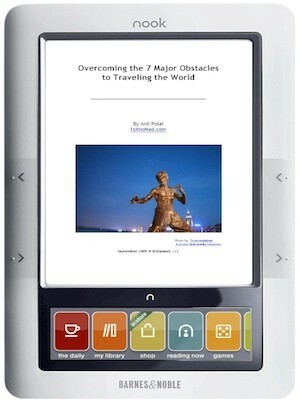 Overcoming The 7 Major Obstacles To Traveling The World also contains many personal stories other world travelers like John Bardos, Marina Villatoro, Dan’s Adventure, The Q Family Adventures, Deb and Dave, The Road Forks, and Cody McKibben to help you build your knowledge of how to prepare for and sustain long-term travel. 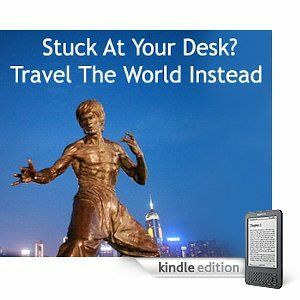 You can begin your plan for traveling the world by purchasing Overcoming The 7 Major Obstacles To Traveling The World for your laptop or directly to your Amazon Kindle or Barnes & Noble Nook eReaders. Get more perspective on Overcoming The 7 Major Obstacles To Traveling The World by reading some of these reviews by other bloggers and travelers.